Tackling the challenges of reducing costs, optimising processes or increasing efficiency with yesterday’s solutions will not yield the required results to create a competitive advantage in today’s competitive business. Availability of big data for analysis, increased connectivity, and secure cloud-based applications etc., connect people, processes and assets, providing continuous inputs and improvement opportunities. The Industrial Internet of Things (IIoT) has ushered in huge potential: predictive maintenance, asset information management and device configuration are just some examples of the opportunities digitalisation has in store for companies. Endress+Hauser is driving IIoT forward through innovative products and solutions as well as by working effectually with its partners, says Prasanth Sreekumar, head of marketing-ME. The advantages of digitalisation in the process industry can already be seen clearly. Increased networking opens new opportunities in process optimisation and increases plant efficiency. Endress+Hauser is therefore constantly increasing its offer of products, solutions and services to increase customers’ productivity and system availability while expanding competitiveness, he says. Endress+Hauser is not new to IIoT, or rather IIoT is not new to Endress+Hauser. It was one step ahead on the path of digitalisation, when it introduced a pioneering sensor technology for liquid analysis in various industries such as chemical, power and energy, food and beverage and water and wastewater over 10 years ago! ‘Memosens’ sensors measure the pH-value in liquids, for example, and transform it into a digital signal while still in the sensor and is passed on via a contactless system and provides extremely accurate, reproducible and reliable measurement results. Memosens was presented with the ‘Digital Champion Award’ in the category Digital Products and Services in June 2017, he points out. Endress+Hauser is committed to supporting its customers along the road to digitalisation. Tailor-made cloud solutions make use of specific data from production processes and serve to increase efficiency alongside conventional plant topology. 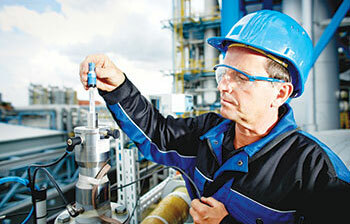 More than 40 million Endress+Hauser instruments are in use worldwide. These instruments are constantly creating a huge amount of data and valuable information. Unfortunately, this data remains often unexploited. "We notice that the ecosystem around the oil prices is normalising, albeit slowly. Hence, optimisation is the order of the day and with big data and analytics, this is easily possible. Endress+Hauser has developed its own IIoT eco-system and can help customers in unlocking this potential in every field," he says. "What better platform than Adipec to put forth this point," he says adding that Adipec continues to be one of the premium exhibitions in the region, engaging stakeholders across the hydrocarbon industry spectrum. Endress+Hauser has been part of Adipec since the past six years now and the interest and anticipation of being part of this show has not diminished over the years. Innovation and Digitalisation is the core message and theme of the company’s stand this year. "Apart from the IIoT-enabled innovative products, we will also be conducting a series of presentations at our stand addressing key topics like Digitalisation (IIoT), Safety, Asset management, gas analytical solutions etc," he adds.